Take the Side Street: And Then There Were Doors! And Then There Were Doors! 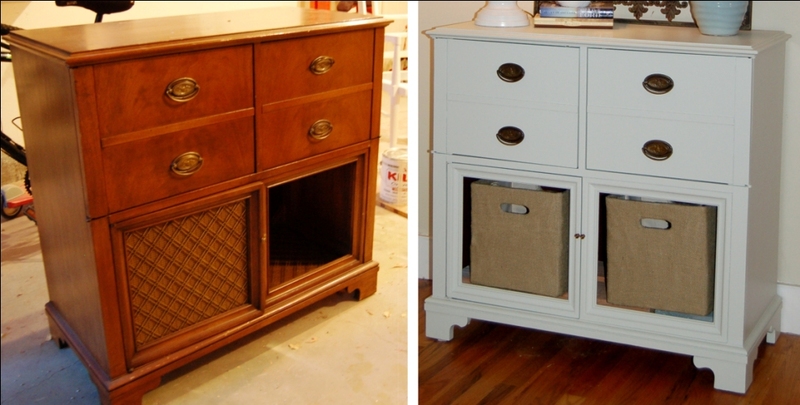 A couple months ago, I transformed this old $10 thrift store radio cabinet. Initially I chose to use bins in the open doors to maximize the available storage because the right door is inoperable. If I covered it I would only have access to that space through the other side (as there's no divider between the bottom two cabinet spaces). I lived with it a while, and... meh. I didn't love it. But I'm flexible, and I'm a mind changer who likes to make things up as I go along. So I decided it was time for doors. Originally I had received several suggestions for things like chicken wire, or decorative metal grilles -- and I liked the idea but I didn't know if they would fit with the piece and with my decor. Specifically, I am sort of in love with the old oval pulls and their patina, and I didn't know how well they'd jive with chrome grilles. So, I decided to go the booooring route and fit in plywood panels to create the look of a classic cabinet door. The first step? 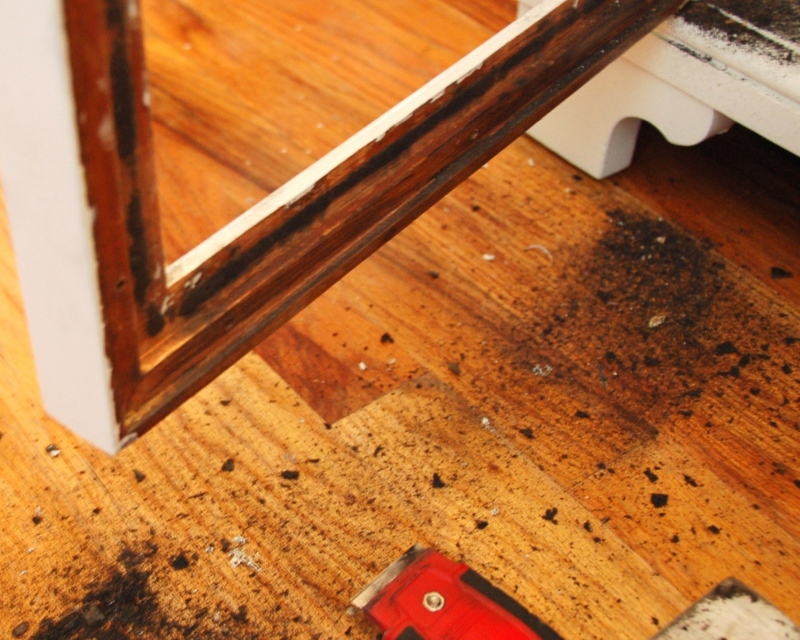 Removing the petrified foamy adhesive gunk from where old fabric panels were attached to the doors so that the new panels would fit nicely without a gap. A moment of silence for my gross sacrifice? Ew. After that was done it was time to attach the plywood panels. I used Gorilla Glue because it seemed easy peasy...until I stuck the panels in. But uh oh! They wouldn't lie flat! Curses! It was time for some clamping action. I had to get a bit creative to hold the panel in the right side door (the one that doesn't actually open)... but I'm resourceful and I've always said there's nothing that sugar or wine can't fix. Or butter. Or chocolate? Or doughnuts... but not chocolate doughnuts. Yuck. Anyhow, this time it was sugar that came to the rescue. Sugar and money. Confused? After some caulk and paint, I finally had my finished product (except for when I repaint it later this Spring but shhhhhhhhh don't tell my husband that)! The bad news? I'm not sure that I like it. Bah! It's sort of okay from that angle... but if you look at it, and then quickly look away, or kind of look at it but not really? Or maybe if you squint? Doesn't it look a little out of proportion? Oh, such a dilemma! I feel like the open doors and bins lended a bit more weight to the bottom half of the cabinet, balancing out the bigger pulls on top. 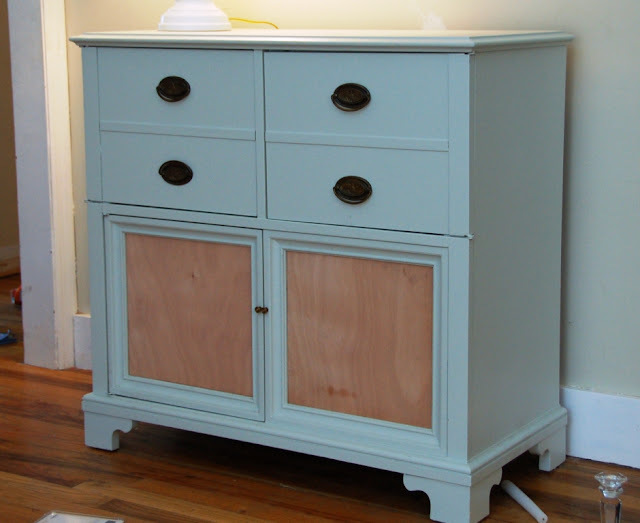 Now with the solid bottom doors and their baby knobs and skinny molding (that won't support a bigger knob, by the way) I feel like it's a bit top heavy. I'm not a big stenciler, but I almost feel like the center panels need a stencil treatment like this one, albeit in a more subtle complementary tone, to balance it out. What do y'all think? Do I need a doughnut to shut me up or is my little cabinet in need of some more love? I actually really like the doors! I'm wondering if a subtle color change might give them a little depth? I don't know what the color scheme of the rest of your room is, but maybe painting out the center panels of the doors a soft dove grey [or something along those lines] might balance it out a little? You are good! It looks great, really like the doors, I'd leave them as it for now and see what you think in awhile! I LOVE this and think you are uber-talented to get those doors looking so good again!! You could add some moulding or chunky frames to the panels to bulk them up a bit. It really is beautiful the way it is, though!! I think it looks nice, and I agree about the pulls! We have my grandma's antique dressers in our bedroom and they have the same pulls. I love them! I sort of feel like the panels need something too. I think the stenciling idea would be great. Or maybe covering the panels with fabric? 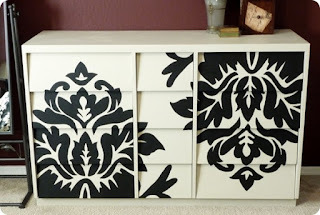 I also had a friend who used scrapbooking paper and hodgepodge on dresser drawers for her son's room. You could probably try that or look for a wall paper that you like and wallpaper just the panels. Looks much nicer with the panels. Even if it seems a bit top heavy. It is slight and a fair trade. Love your clamping technique. For sure! You'll figure out something! It's looking good! Love it!! This color is fab! It definitely is much better but the door panels are kind of inset vs. the drawers and I think that's what's throwing the look off balance. I would cut a piece of cardboard or mat board to fit each door, wrap each in batting and then a beautiful fabric, taping securely on back of cardboard, and then velcro to your doors. It will fill out the space some, you can change the fabric easily as your decorating style changes, and you can easily remove it if you don't like it. I've been checking and enjoying your blog each day. Thanks for sharing all your great ideas. 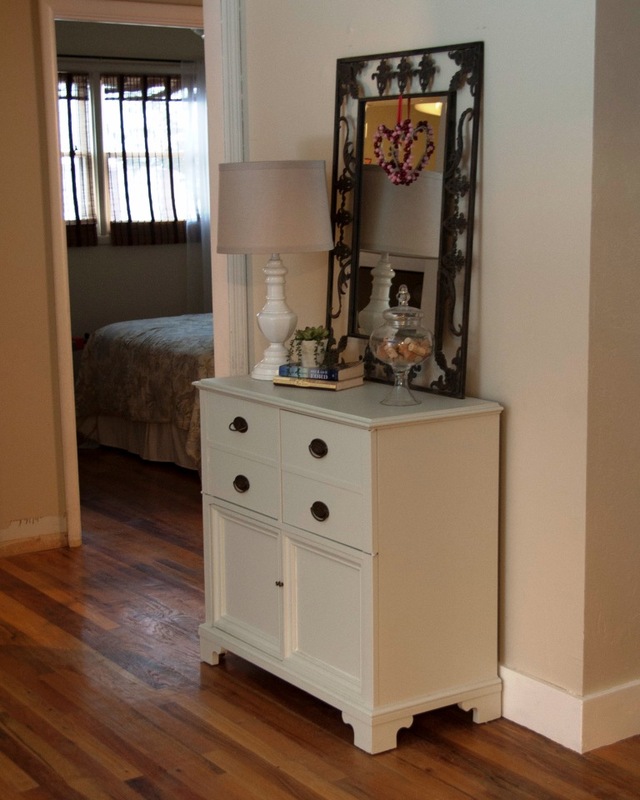 How about adding some molding across the doors (to kind of mimic the look of the drawers at the top) or a cross to divide into four panels? Something to break up the flat expanse of white. Hi Anna! Oh, you did a wonderful job on your cabinet. The doors look good! Now I'm a stenciler and I think that would really look great on your doors. There's some great designs out there to choose from. Visiting fro Someday Crafts. Great job! If it would look good with your decor, I'd go with a stencil, but it looks good as is. Thank you for sharing... I have 2 old dresser that I need to refurbish! Love it! I love the doors! You did a great job. 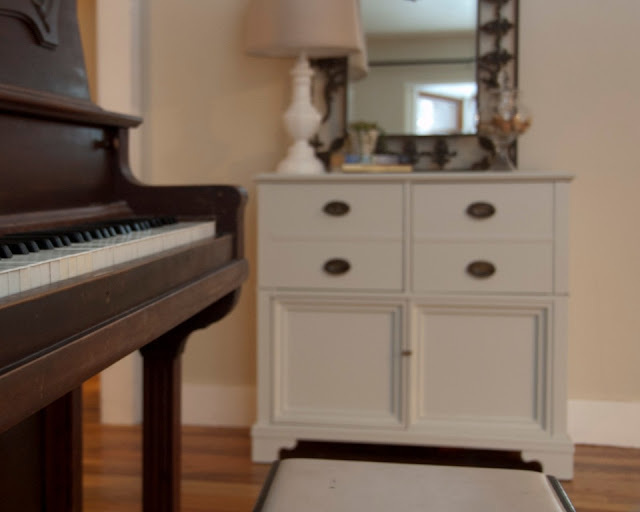 it looks gorgeous to me, but what if you just got some matching knobs just for show? To be honest, i liked the upen space more. maybe if you do a non-dramatic stencil on the doors it would look better...or fins some nobs. love the transformation from the beginning though!!!! So I know that you've already glued in the panels and everything but... What if instead of using the flat plywood panels you used some sort of beadboard/wainscoting or something similar to give the door texture and dimension. Or you could even get some skinny moulding that matches the current moulding around the door and frame out a smaller square inside the door to give it dimension, think of it as a square inside of another square. (hopefully that makes some sort of sense) Anyways, I LOVE reading your blog and I can't wait to see the finished product. I love it just like it is!! It is beautiful...great job!! What if you added some molding in an "x" pattern? I think that would spice it up! 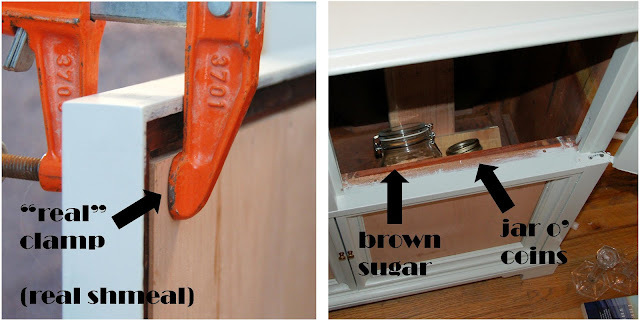 Although coping the new molding on top of the old molding might be a little tricky, but it's nothing a little painters caulk can't fix, right! Looking good though! وايضاً نود أن نقوم باطمئنان جميع عملائنا فيما يتعلق الأثمان التي تقوم بتقديمها شركتنا فأسعار مؤسسة نقل اثاث بابها لا يمكنه احد في مجارة تلك الأثمان التي تقوم بتقديمها المؤسسة نظراً لباقي أسعار المؤسسات لهذا فالأسعار متميزة بشكل كبير فكل ما عليك عزيز الزبون لاغير التواصل بنا وسوف تجدنا بجانبك لحظياً لإنجاز هامة نقل عفشك واثاث منزلك بإتقان وبحرفية شديدة حيث تقوم شركتنا باستعمال الطرق العلمية الجديدة ذات التقنيات العالية إلى أن ينتهي إنجاز هامة نقل العفش بكل يسر وسهولة دون أي خسائر.